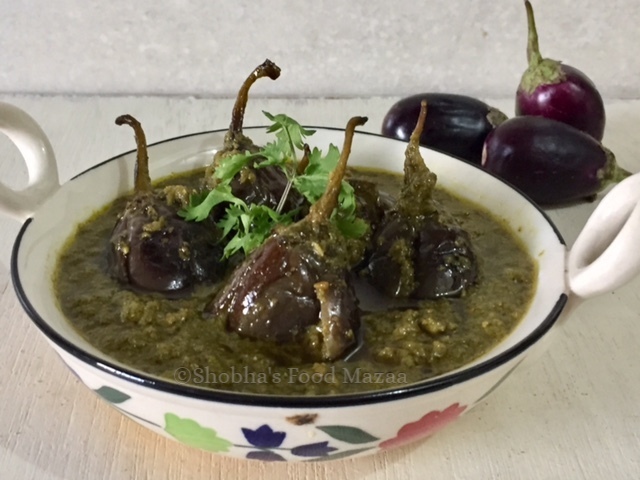 Here is a brinjal recipe made with aromatic green masala. 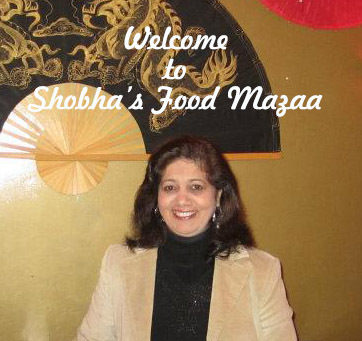 You can make it dry or with gravy as you prefer and serve it with rotis , rice or pulao. 1. Wash and slit the brinjals leaving the stem intact. Soak them in salt water. 2. In a pan add a little oil and shallow fry the brinjals on medium flame and simmer until half done. Remove and set aside. 3. In the same pan heat a little oil and add the green masala paste. Add the salt, turmeric powder and coriander powder. 4. Put the fried brinjals. Add half cup water and simmer to cook. If you need more gravy to serve with rice, add 1 cup water. The gravy looks so rich, spicy and tempting... Would be great for chapathis.. I think this would make a great side for briyanis, absolutely delicious. Thank you for sending it to Iftar Moments. wow! !baingan cooked in a new way..looks delicious.. I am missing those cute brinjals .. looks delicious. 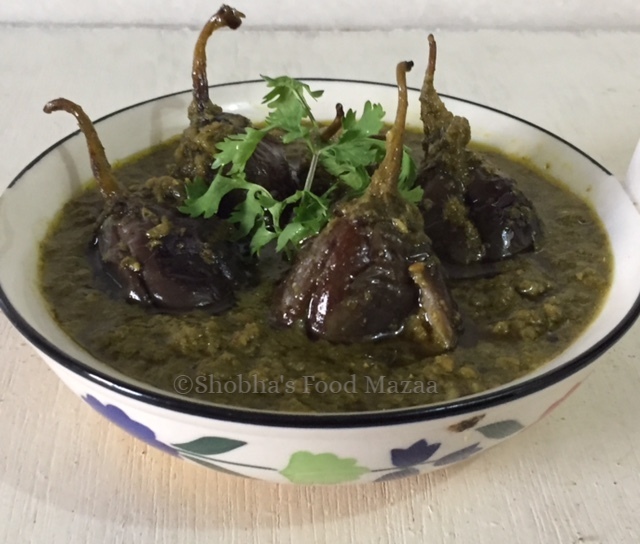 Yes, baby brinjals are so cute and easy to cook. 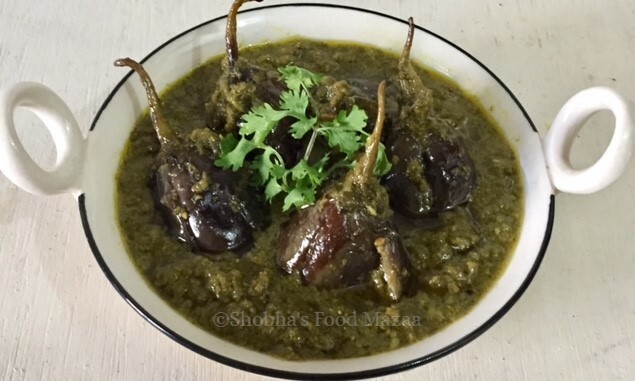 Such an inviting baingan dish. Amazing! The gravy is too flavorful and delicious. This looks like it has so much flavour in it, and really easy to make too. 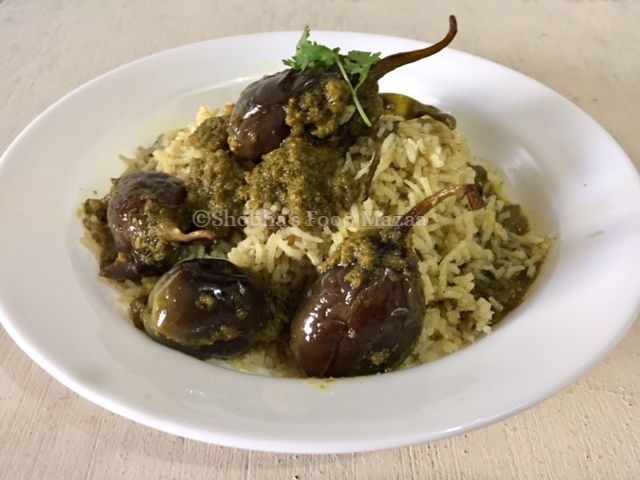 Yes Dannii.. very simple one.. Must try it..
Brinjals in a green gravy... sounds delicious. Always looking for new ways to prepare sabjis. This masala is used a lot in Sindhi Cuisine ..